Sheep is the eighth animal in the Chinese Zodiac. Sometimes, it is also denoted by a Goat or Ram. The Sheep is symbolic of purity, gentleness and kindness. The natives born under the Zodiac Sign of the Sheep imbue the characteristics of the Chinese Zodiac Sheep. Such people may be gentle in nature but this trait of them never prohibits them to do what it takes to achieve their goals. They may not look like it but deep inside, they are strong willed and hardworking. Their perseverance and tenacity can never be questioned. The Sheep people are keen observers, who notice things quietly. They are good at communication but avoid talking unnecessarily. They are very likable. Their kind-heartedness and polite behaviour helps them to win hearts. Sheep people are close to nature. They are admirers of children. Their inclination towards arts and spirituality is remarkable. They understand the value of money and are spendthrifts. People born in the Year of the Sheep may sometimes act indecisive. Sheep people tend to be pessimistic at times, due to which they miss good opportunities. Their mood swings are sometimes not easy to cope up with. But they soon get back to their own selves without investing much of efforts. Their patience levels are worth mentioning. They are tough survivors, who do not bend their knee easily, even in unfavorable circumstances. You are a Sheep native if you are born in any of these years - 1919, 1931, 1943, 1955, 1967, 1979, 1991, 2003, and 2015. As we know, the year 2019 will be the Year of the Chinese Pig. The Year of the Dog that has not been favourable for the Sheep will be over, giving a kickstart to the Year of the Pig during which the tables will turn for the Sheep people. The Sheep/Goat people will be able to complete their pending tasks before completing the 12 year Zodiac cycle of the Chinese Zodiac. A number of opportunities are likely to knock your door. You may choose whatever floats your boat. The Sheep people who are smart enough to not let go of opportunities are bound to flourish during the Year of the Pig. As per Chinese Horoscope 2019 Predictions, amazing surprises and new experiences wait for those who are bold enough to take risks. You will get to connect with your family and friends, further strengthening your bond. There will be people out there who will be jealous of your success and will try to push you down. During this year, you will get to know who is your true friend and who is an enemy masquerading in a friend's skin. Do not let your guard down if you want to move ahead. Make use of very opportunity that brings you hope. The Year 2019 will be your silver lining, which will make you realise that your dreams have the chance to come true. You should let go of your clumsiness and laziness if you want to achieve success. You inclination towards arts is likely to bring about some positive change in your life. Be a go getter and grab the best opportunities that come your way. The Year of the Pig will be favourable for the Goat people in terms of career and profession. The people who have been putting their efforts and investing their energy since a long period will eventually be able to reap the sweet fruits of their hard work. Those who are newbies in their professional life will get to lay a strong foundation for themselves. The Year of the Pig will be better for jobs as compared to businesses. However, putting your best efforts will help you to manage your business as well. Because of an inclination towards artistic things, you are expected to perform well in the field of art if you are related to it. It is anticipated that the work done by you in the past will help you during this year. Your tenacity coupled with good luck is likely to do wonders for you. If you have innovative ideas and plan to begin new projects, you must give them a green signal. Starting novel ventures will pan out to be favourable for you in the long run. You will be a distinctive person at your workplace, known for your qualities of perseverance and hard work. Your competitors will stand no chance against you. You are advised to make sure that everything that you do in your profession adheres to the law and legal policies. Making investments for securing your future is a good idea that you should give a shot to. This year will mark a major turnaround in the social life of Sheep people. You will get to realise the difference between real and fake, when it comes to your friends and social circle. Under the influence of the Chinese Zodiac Pig, who selects his friend circle with utmost care, you will choose your friends wisely. Also, you will get to know who is a true friend and who has been backbiting you the whole time. You will be able to let go of bad company, which will have a positive impact on your life. On your professional front as per Chinese Horoscope 2019 Predictions, you will be the target of jealous people. They will try to taint your reputation but will not be able to do so if you act maturely and practically. You may be too emotional at times which may turn out to be a pitfall for you. Competition will turn some friends into foes, which is a thing you should be wary of. Maintaining your professional relationships will be an important part of your life which should be done in a proper manner. The Year of the Pig brings hope for you in the domain of love as well. The Sheep people who have been looking for their perfect match or their soulmate might come across them. You will have the strings of your heart connected with someone. The ecstasy of love will do wonders to your life. Those who already have a love interest will have their feelings reciprocated. You are likely to get the kind of love relationship that you have been looking for. You may fall in love with the people of the Pig Zodiac in the blink of an eye. Relationships with Ox, Dog, and Rat might be difficult to sustain and may crumble down. Falling in love with a Pig or Rabbit may lead to a “happily ever after” kind of love story for the Sheep people. 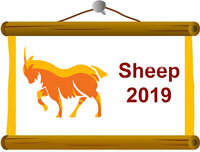 Chinese Horoscope 2019 says that people born in the year of Sheep are gentle beings who are genuinely caring. They will attract admirers because of these traits. Once in love, they will put their best efforts to make the relationship work. The year 2019 is the Year of the Pig which has very good compatibility with the Sheep in terms of love. Thus, this year is likely to bring about some positive change in the love life of the Sheep. Those who are looking forward to tie the sacred knot of marriage will eventually be able to do so in this year. Married life will be blissful if a proper channel of communication is maintained. Misunderstandings are a part of every relationship and during this year, you will realise how important it is to clear them. Birth of a child may bring a wave of happiness in your life. The Sheep people will work hard during this year. They will make every possible effort to compensate for the mistakes that they did in the Year of the Dog. You will gain popularity and will give no second thought when you get a chance to be in limelight. You will have a capricious side which you will keep hidden from others. You will try to make the best out of what you got. New innovative ideas will help you to reach another level of success. A little bit of self-improvement will help you to be a better person. You will be an opportunist. Complaining about things of they do not go as per your convenience will be a day to day chore for you. You will be skilled and will deal with adverse situations in the best possible manner. Chinese Horoscope 2019 suggests that you will spend time with your near and dear ones. Their company will make you forget all your worries and woes. You will be a lover of nature and will spend a part of your leisure time in the lap of mother nature. This will help you to attain mental peace. Conflicts and arguments may arise at your workplace, which you have to tackle very carefully. A little leniency may lead to many problems. Because of the success and luck that will follow you during the Year of the Pig, you may act imprudent at times. The “think before you act/speak” approach should be your motto during the year 2019. The people born in the Year of the Chinese Sheep need to be careful in matters of their health. “Health is wealth” and this is why it comes first on your priority list. The Sheep people are hard workers and often forget to take care of themselves, which leads to a degradation in their health. Chasing your goals may lead to negligence of existing health issues. You should maintain a fine balance between your personal life and professional life. Also, you should take out some time for taking care of yourself. Carelessness on health front is not something that will help you in your life. Whatever you do, do not forget to nourish your body with the required nutrients. You should realise that food is the source of that energy which will help you to make all your dreams come true. Thus, taking proper diet and taking care of your body is essential. Not only physical health but also mental health should be taken care of. You should be careful while being on road. Adhering to safety measures and traffic guidelines will be a safe decision to opt. Rash driving has not been a favourite sport for the Sheep and should always be stayed away from. Some mood swings might put you in dilemma. Fret not, they will be periodic and will fade away soon. In a nutshell, the Year of the Pig is favourable for the people born in the Year of the Sheep. There will be more positives than negatives waiting in the year 2019. You should make the best out of the chances that you get so that you do not have to repent it later. Any problem that you face should never let your confidence level drop down. You should realise your potential and give your best shot. Your lucky stars will shine bright during this year and their effect will be seen in all spheres of your life. You need not depend on your luck solely. Have faith in your abilities and rely upon your own skills. During this year, the Sheep people will get to know what their weaknesses are. Take it as an opportunity to sweep your negative traits out of your life. Creating a better version of yourself by improving day by day. During the month of March, you are likely to flourish as it is the month of the Rabbit. You will enjoy a good relationship and if you are married, you will gel well with your partner. The Month of June will be the Month of the Horse, your ruminant friend. During this period, you will be able to complete your pending tasks. The month of November will be favourable for you as well. You need to be a bit cautious during the month of the Ox (2019 December 2019 to 24 January 2020) as the Sheep and the Ox do not really get along well. Looking at the brighter side, you must keep moving in the forward direction with an aim to achieve your goals.